It is so refreshing to see a collection that embodies ingenious creativity with the design essentials of lines, silhouette and fabric. My belief of not following the status quo, for what other designers are doing is what drives consumers interest for new designs and new customer base, a characteristic of Blanc De Chine. The blouses, cut with clean lines, along with the flawless flow of fabric makes every piece light and airy. I love the silhouettes of all the pieces which I believe is attributed to their smart use of fabric. I got a chance to personally feel and touch some of the pieces and they do live up to what you see on the catwalk and even more. The fine tailoring and use of stitching as a finishing, is stunning. Most of all, the color palette for the pieces shown in the collection, is what sets the mood for Blanc De Chine’s philosophy for timeless designs with ‘. . . different dimensions of consciousness’. 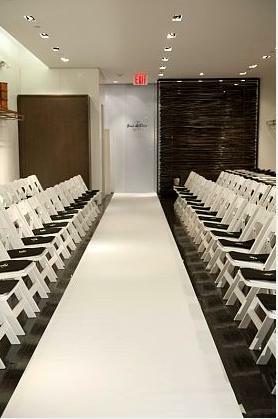 Their preference, to show their Spring/Summer 2011 collection a few weeks later after New York Fashion week, is a nice twist for fashionistas to focus on a brand that is often overlooked for its ingenious creativity and modern sensibilities. Tru Fashionistas Now, feast your eyes and get ready to shop Blanc De Chine’s Spring/Summer 2011 collection because we love what we saw.